Mr. Wolf’s Class by Aron Nels Steinke. Scholastic Graphix, 2018. 9781338047691. 160pp. I think I first bought one of Steinke’s self-published minicomics 7 or 8 years ago, back when the Stumptown Comics Fest was still its own thing in Portland. His comics then and since have a genuine good-natured quality, and I really admire how upbeat they are. This is no exception. 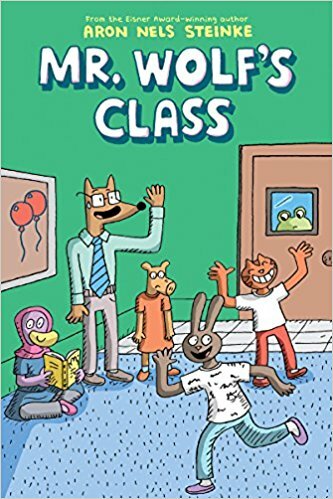 Mr. Wolf is a new teacher at his elementary school, and none of his 17 students (each a different species of anthropomorphized animal) is more excited than Margot (a rabbit), who just moved to the neighborhood. On the bus she meets a little slug guy. Sampson (a frog) gets a slightly nasty note and then in trouble for running (to go to the bathroom). There’s some discussions of palindromes brought on by Aziza’s name (she’s a duck who wears a headscarf). And they take a trip to the library where the librarian, Mrs. Bird, checks out books while wearing her fancy red cowboy boots. After a student decides to take a nap in a box, there’s a bit of excitement when everyone searches for her. There’s a brain in a jar, and sharing. By the end of the book it’s clear they’re all pretty good kids, and that they’re in good hands. The Gallery of Regrettable Food by James Lileks. Crown Publishers, 2001. 0609607820. Sarah: Part of the significance of this book, because there are plenty of people out there who make fun of the horrible illustrations in old cookbooks, is that James Lileks was one of the first. He was really early on the Internet scene, he has this wonderful website that he’s been working on since the nineties — it’s a great collection of weird old stuff. He’s also funny; he’ll comment on the pictures and not just say “oh, how disgusting!” He’s really amusing, and he’ll start bizarre mini-fictions that continue within and across his captions. S: He talks about how his mom in, I think, 1962 was given a terrible promo cookbook from the North Dakota durum wheat growers… that was the start of his collection, when he found it in his mom’s closet, untouched, in the 90s. He has a fictional recipe in there based on all the recipes in these books, where you carefully put one atom of chili powder in a dish with a pound of hamburger meat, 36 pounds of flavorless cheese… “if substituting spackle, crumble one yellow crayon for color,” one cup dusty crumbs from the toaster, three grains pepper, one pound salt, then that one atom of chili powder. Sparks! by Ian Boothby (author) and Nina Matsumoto (illustrator). Scholastic Graphix, 2018. 9781338029468. 190pp. That first line is one of the best of all time, though the AI litter box doesn’t just tell it’s own story, it also tells that of two cats, August (a genius inventor and its creator) and Charlie, the brave cat who helped August escape the lab where they were experimented on. Together they wear a robotic dog suit to perform heroic deeds around town and hide their identities. A local newscaster is suspicious of the dog — is it causing the trouble it’s solving? A very mean and smart “baby” out to conquer the world is trying to capture the cats. And there’s a chatty squirrel who may not be as friendly as he seems. It’s got the beauty and insanity of a great Saturday morning cartoon, and the heart of a wonderful story about friendship. Plus it’s fun. I’m shoving this into the faces of both my teenage daughter and my “stop trying to make me laugh” wife because I know they’ll love it, too. Matsumoto and Boothby co-created a 2009 Eisner Award winning short, “Murder He Wrote,” which appeared in the comic book The Simpsons Treehouse of Horror #14. Boothby writes quite a bit for Matt Groening’s Bongo Comics line, as well as for TV. Matsumoto has done work for Bongo, wrote and illustrated Yōkaiden for Del Rey, and created the popular webcomic Saturnalia (which sadly no longer seems to be available online).